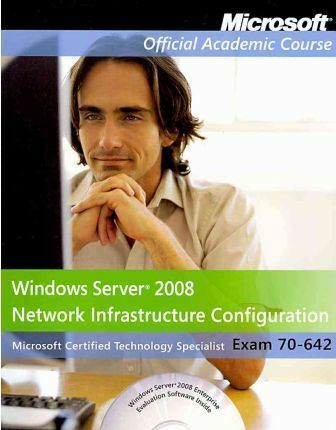 Exam 70-642, Windows Server 2008 Network Infrastructure Configuration. The newest iteration of the Microsoft Official Academic Course (MOAC) program for network administration courses using Windows Server 2008 and mapping to the Microsoft Certified Technology Specialist (MCTS) 70-642 certification exam. The MOAC IT Professional series is the Official from Microsoft, turn-key Workforce training program that leads to professional certification and was authored for college instructors and college students. MOAC gets instructors ready to teach and students ready for work by delivering essential resources in 5 key areas: Instructor readiness, student software, student assessment, instruction resources, and learning validation. With the Microsoft Official Academic course program, you are getting instructional support from Microsoft; materials that are current, accurate, and technologically innovative to make course delivery easy. Call one of our MOAC Sales Consultants and request your sample materials today. Unit 1: Introducing and Installing Microsoft Windows 2008 Networking. 1. Introduction to Networking Concepts. Introduction to TCP/IP addressing - UD 1.1 Configuring IPv4 and IPv6 addressing. IPv4. IPv6. Introduction to DNS. Introduction to DHCP. Introduction to Routing. Introduction to Network Access Protection. 2. Installing Microsoft Windows Server 2008. Installing the software. Configuring basic network settings. Choosing Server Roles. Configuring Storage. Installing and Configuring Server Core. Using the Command Line Interface. Configuring Windows activation. Unit 2: Configuring Microsoft Windows 2008 Server. 3.Configuring and Managing the DHCP Server Roles - UD 1.2 Configuring DHCP. Authorizing DHCP Servers. Configuring DHCP Scopes. Configuring DHCP Relay. Configuring DNS Dynamic Updates. Managing the DHCP Database. Using Automatic Private IP Addressing. 4.Configuring and Managing the DNS Server Role (Name Resolution). Configuring DNS server - UD 2.1 Configuring DNS server. Configuring Domain Name System (DNS) Replication - UD 2.4. Configuring Domain Name System (DNS) Replication. Configuring DNS Zones - UD 2.2 Configuring DNS Zones. Configuring DNS Records - UD 2.3 Configuring DNS records. Configuring client name resolution - UD 2.5 Configuring DNS names resolution client. 5.Configuring Routing and Remote Access (RRAS) and Wireless Networking. Routing - UD 1.3 Configuring Routing. Remote Access - UD 3.1 Configuring Remote Access. RADIUS Server. Configuring IPsec. Configuring Wireless & 802.1X access - UD 3.4 Configuring Wireless Access. 6.Configuring File Services. Planning a File Server Deployment. Configuring a File Server - UD 4.1 Configure a file server. Working with Disks. Using the Disk Management Snap-in. Designing a File Sharing Strategy. Creating Shares. Assigning Permissions. Installing a File Services Role. Using the Distributed File System (DFS) - UD 4.2 Configure Distributed File System (DFS). Introducing DFS. Configuring DFS. 7.Configuring and Monitor Print Services. Deploying a Print Server. Using Networked Printers. Sharing a Printer. Configuring Printer Security- UD 4.6 Configure and monitor print services. Managing Documents. Managing Printers- UD 4.6 Configure and monitor print services. Using the Print Services Role - UD 4.6 Configure and monitor print services. Using the Print Management Console. Unit 3: Maintaining the Network. 8.Maintaining and Updating Windows. Monitoring a Windows Server 2008 network. Capture performance data - UD 5.2 Capture performance data. Monitor event logs - UD 5.3 Monitor event logs. Gather network data - UD 5.4 Gather network data. Configuring Windows Software Update Services (WSUS) server. settings - UD 5.1 Configuring Windows Software Update Services (WSUS) server settings. 9.Maintaining Network Health with Network Access Protection & IPSec. Configuring Certificate Services - UD 1.6 Configuring certificate services. Configuring Network Access Protection (NAP) - UD 3.2 Configuring Network. Access Protection. Network Policy Server. Network health policy validation. Network health policy compliance. Limited access enforcement. 10. Securing Data Transmission and Authentication. Configure IPSec - UD 1.4 Configure IPSec. Configuring network authentication - UD 3.3 Configuring Network Authentication. Configure firewall settings - UD 3.5 Configure Firewall Settings. 11. Maintaining File and Print Services. Configure shadow copies - UD 4.3 Configure shadow copies. Configure backup and restore - UD 4.4 Configure backup and restore. Manage disk quotas - UD 4.5 Manage disk quotas.